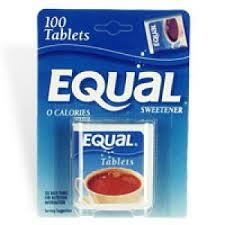 Equal is a brand of artificial sweetener containing aspartame, dextrose and maltodextrin. It is marketed as a tabletop sweetener by Merisant, a global corporation which also used to own the well-known NutraSweet brand when it was a subsidiary of Monsanto and which has headquarters in Chicago, Illinois, Switzerland, Mexico, and Australia. In French Canada, Equal is known as "Égal".